As promised, below are pics from the FAB blue and white Baby Sprinkle we did for our dear friend Caroline and her newest lil' addition, Baby Will! It was so much fun (there was of course LOTS of champagne)and baby Will now has some blue in his life! Caroline and her husband Billy are pretty much the cutest couple in America and she has been my best friend since we were 15. With big sis Montgomery always in pink, we decided to spice it up for baby Will with blue and white decor from top to bottom! The favors were a huge hit!! Personalized champagne labels...$3.50 each and what an added touch! 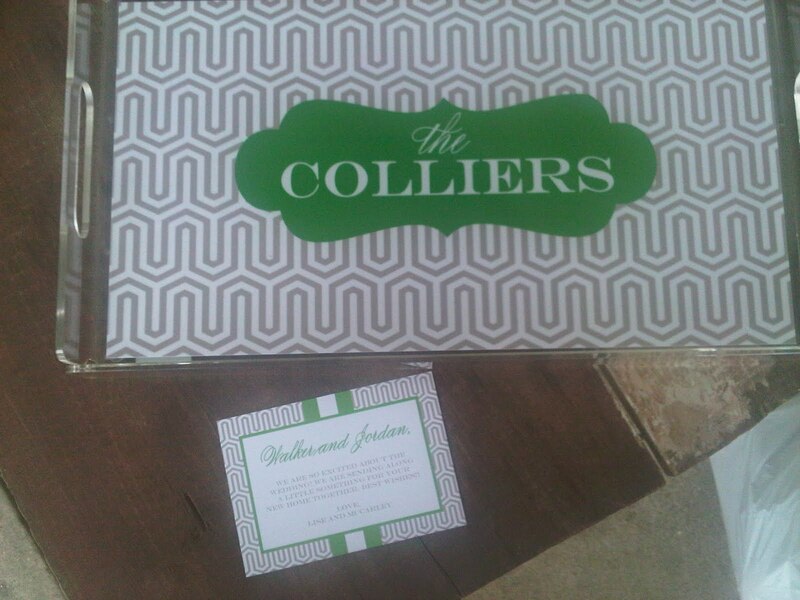 Double sided Frames with monogram, $30 each--these are SO great. A new lucite item we are now offering! Monogram on one side and picture with border on opposite side! 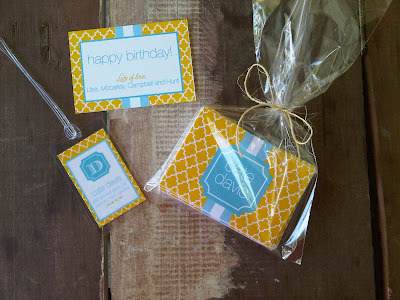 Straw tags, ADORABLE! These always make such a statement! $0.75 each! Petit Fours from A Perfect Bite! Can't even begin to tell you how good these are. UNBELIEVABLE. She is AMAZING. I mean, look at the detail on that onesie!!!?!? The girls in the kitchen preparing! Is it not OH so swanky?!?!?!? We hope you all love it as much as we did! It must be something in the water, right?! We have had so many baby gift orders recently! We just thought we would share some of the SUPER adorable ones..new and old!!! Twin Baby Notecards...Minnie and Tully..precious names!!! 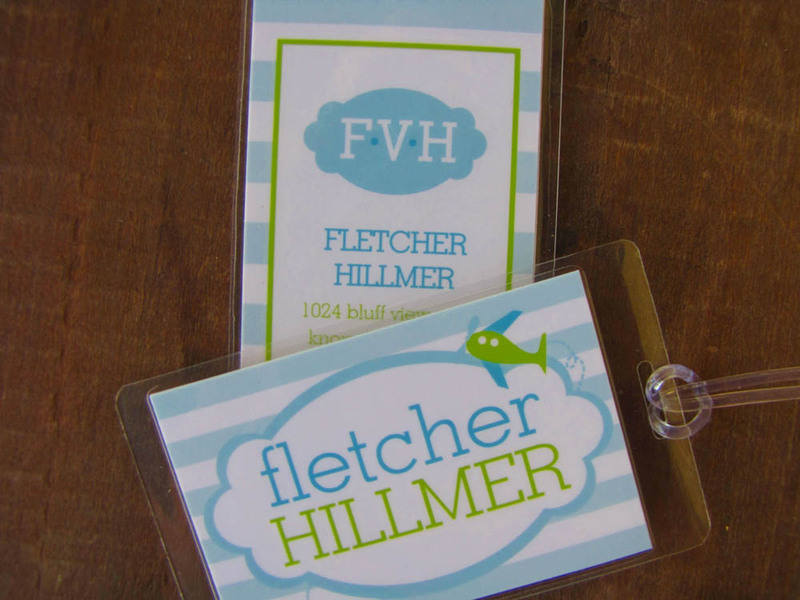 Luggage Tags, $5! How adorable is the airplane?! These make such great happys for a new mom or for yourself! How precious is this for the newest little man, Bass? This is one of my best friend's from college's little boy. Adorable parents who LOVE to hunt. We thought these were THE most appropriate notecards!! We like to call it southern..not redneck...haha! Fun and Whimsical Birth Announcement! We love the "Oh Happy day"! So fun!! And,we are also hosting a baby sprinkle/sip and see for one of our best friends this weekend, so pics of those will be next week! Get excited!! OH BABY is right!!!!! 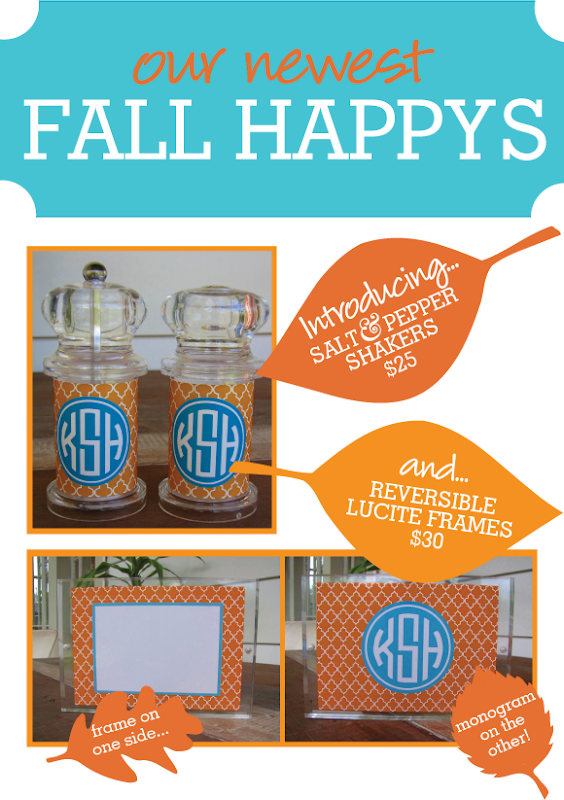 Eblast Sign Up and Our New Fall Faves!!! Happy almost Fall everyone! Are we not all SOOO ready for summer to be gone and to enjoy the leaves changing, chili on the stove, and pumpkin spice lattes?! Never thought we would say that!!! Just wanted to share our eblast from this morning! See below! If you didn't get this sent to your email bright and early, then you are missing out!! Be sure to sign up on our website contact page so you can be the first to know of our new swanky swag and specials!!! Also..stay tuned...Christmas Card pre-order coming VERRRRYYY soon! Order early for 15% off! Custom Gifts and Matching Notes! We just did a few gifts for a customer that we sent directly to the recipient, and thought...geez, these are SUPER cute. And we weren't sure everyone out their in our blog land knew that we do this! Did someone recently get engaged? Do you need a quick super swanky wedding present? Did you just want to say thank you to someone special? And we know these pics are by no means spectacular! They are from Blackberry, so we apologize! 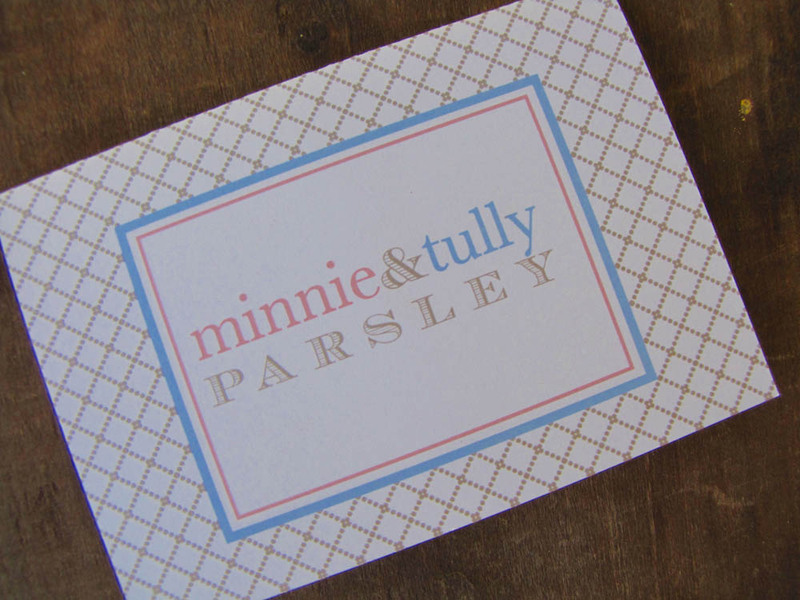 Letterpress is just so unbelievably gorgeous! We had to share this!! 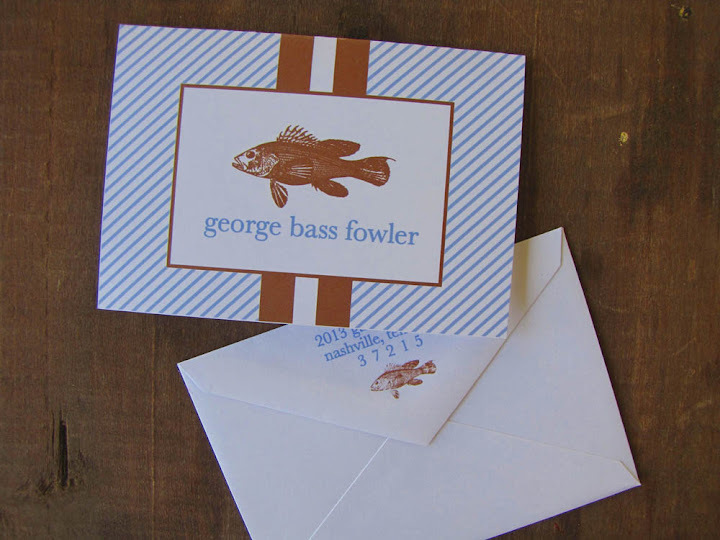 We worked with bride Sairey last year to do her amazing vintage postcard inspired Save the Dates. She wanted a romantic feel with the colors of Bermuda, the location of her destination wedding. Below is the design she went with...we just LOVE it!! Then it came time for the invitations and since paper is one of Sairey's loves as well, she decided she could not do anything less than letterpress! We are so grateful she wanted to go this route..It just has this timeless feel and really is our favorite form of printing. We then worked with Sesame Letterpress out of New York City to actually do the printing. We think it turned out AMAZING! What do you all think? We enjoy nothing more than working with a bride like this; from start to finish. Inevitably everything flows seamlessly and looks 100% cohesive. Hope everyone had a great Labor Day! We sure did! 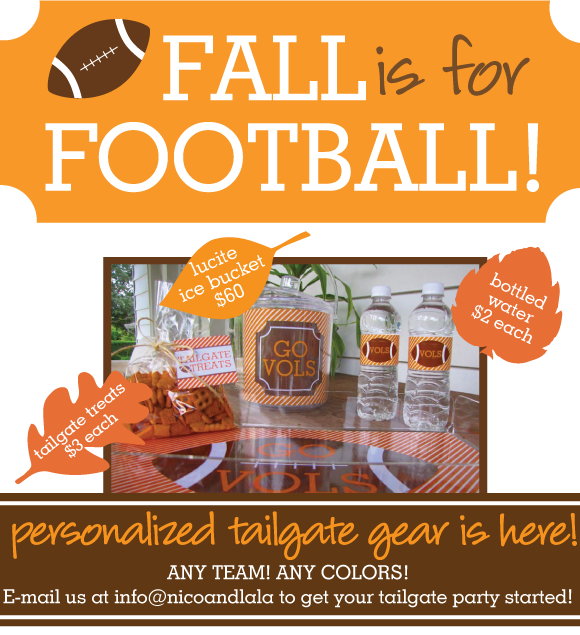 Fall is in the air and we are loving that football season is finally here! SO the beach time we had last week was not only relaxing and rejuvenating, but also very productive!!!! We have been brainstorming on the calendar idea for MONTHS now, and a little down time gets those creative juices flowing!!! Nothing like the bright fun colors of Miami Beach to inspire! Introducing the fabulously swanky, so chic, so preppy, Nico & Lala 2011 calendar!!! We could NOT be more excited!!! Who wouldn't love THIS sitting out on their desk?! And what a fun Christmas gift to give!!! We are now taking pre-orders and they will be available October 1st. 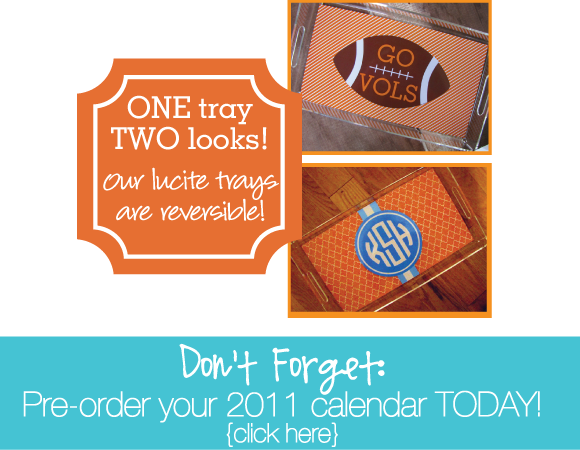 Each calendar is $32 and remember, quantities are limited, so get it while it's hot! Each month will be printed in these vibrant rich colors on a super nice, thick card stock that sits perfectly in its' lucite stand! HOW CUTE?! And up close and personal with a few months in particular! How cute is the stand?! Email us today at info@nicoandlala.com to be added to our pre-order list, and give the gift of swank that lasts all year!